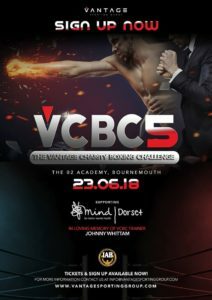 On Saturday 23rd June, Vantage Sporting Group are hosting the 5th Charity Boxing Challenge, VCBC5. For the challenge they have chosen to raise money to support Dorset Mind. The event is also being held in loving memory of VCBC Trainer Johnny Whittam. There is no experience required to take part in the challenge and you will receive 8 weeks worth of training from the boxing coaches at Fit2Box. Vantage will also be offering each participant nutritional advice, kit essentials and training to be done in your own time. The Challenge is open to men and women of all ages and backgrounds. To sign up you just need to pay a £15 enrolment and insurance fee and you will also receive a FREE t-shirt. To sign up, follow this link. ‘Depression and other mental health issues still have a certain taboo about them and only those who have lived through it, or with someone who’s suffered can truly understand the difficulties it brings but also truly appreciate the help of charities such as Dorset Mind. I for one wouldn’t be where I am today without this type of support and can’t thank them enough for the great work they do!! I’ll admit, the training was hard and along the way blood, sweat and tears were shed but I kept reminding myself of why I was doing it and the benefit my commitment would have for others!! The guys at fit2box we’re amazing, really took the time to support every fighter and we’re so professional in their approach to training, fitness, nutrition and health & safety!! The final entry is Sunday 22nd April at Midnight. Tickets are on sale now for the challenge and there are 3 types available. The tickets on offer are Dress Circle Standing, Gods Seated and table seats. There are also two exclusive Royal Boxes that seat 10 people each. To find out more about prices and to buy tickets, follow this link. For more information about events Dorset Mind are involved in, check our events calendar.